ഒരു അമേരിക്കൻ സംഗീതജ്ഞനാണ് മൈക്കൽ ജാക്സൺ. "കിംങ് ഓഫ് പോപ്പ്" എന്നറിയപ്പെടുന്ന ഇദ്ദേഹം ലോകത്തിലെ ഏറ്റവും വിജയിച്ചതും സ്വാധീനിച്ചതുമായ സംഗീതകാരന്മാരിൽ ഒരാളാണ്.തന്റെ സംഗീതം, നൃത്തം, ഫാഷൻ, കാരുണ്യ പ്രവർത്തനം എന്നിവയിലൂടെ ലോകമെമ്പാടുമായി സമാനതകളില്ലാത്ത സ്വാധീനമുണ്ടാക്കാൻ ജാക്സനു സാധിച്ചിട്ടുണ്ട്. വളരെ കുട്ടിയായിരുന്നപ്പോഴെ പാടുന്നതിൽ മികവ് കാണിച്ചിരുന്ന ജാക്സൺ തന്റെ അഞ്ചാം വയസ്സുള്ളപ്പോൾ തന്റെ പഴയ സഹോദരങ്ങളോടൊപ്പം ദ ജാക്സൺ 5 ൽ ചേർന്നു.1980 -ന്റെ തുടക്കത്തിൽ ജനപ്രിയ സംസ്കാരത്തിലെ ശക്തമായ ഒരു സാന്നിധ്യമായ ഇദ്ദേഹമാണ് എംടിവിയിൽ ശക്തമായ ആരാധക പിന്തുണ ലഭിച്ച ആദ്യ ആഫ്രിക്കൻ- അമേരിക്കൻ വംശജൻ.ഇദ്ദേഹത്തിന്റെ ബീറ്റ് ഇറ്റ്, ബില്ലി ജീൻ, ത്രില്ലർ എന്നീ ഗാനങ്ങളുടെ വീഡിയോകളുടെ പ്രശസ്തി വർണ്ണ വിവേചനത്തിന്റെ അതിർ വരമ്പുകൾ തകർക്കാനും ശൈശവദശയിലായിരുന്ന എംറ്റിവി ചാനലിന്റെ വളർച്ചയ്ക്കും കാരണമായി. 2009 ജൂണ് 28 ന്, ബാൾട്ടിമോർ സൺ എന്ന തലക്കെട്ടിൽ "മൈക്കൽ ജാക്സൺ ലോകത്തെ മാറ്റിയ 7 വഴികൾ" എന്ന തലക്കെട്ടിൽ ലേഖനമെഴുതി. "ജാക്സന്റെ സ്വാധീനം ഒന്നിലധികവശമുളള്ളതാണ്" എന്നെഴുതിയ ജിൽസൺ റോസൻ അത് സൗണ്ട്, നൃത്തം, ഫാഷൻ, സംഗീത വീഡിയോകൾ, സെലിബ്രിറ്റി എന്നിവ ഉൾപ്പെടുന്നതാണെന്നും കൂട്ടിച്ചേർത്തു. 2014 ഡിസംബർ 19 ന്, ബ്രിട്ടീഷ് കൗൺസിൽ ജാക്സന്റെ ജീവിതത്തെ ലോകത്തെ രൂപപ്പെടുത്തിയ 80 പ്രമുഖ സാംസ്കാരിക മുഹൂർത്തങ്ങളിൽ ഒന്നായി തിരഞ്ഞെടുത്തിട്ടുണ്ട്..2010 ൽ രണ്ട് യൂണിവേഴ്സിറ്റി ലൈബ്രേറിയന്മാർ ജാക്സന്റെ സ്വാധീനം, സംഗീതം, ജനപ്രീതി, തുടങ്ങിയ വിഷയങ്ങൾ പഠന വിഷയമാക്കാമെന്നു കണ്ടെത്തി. One of many identical statues, based on Diana Walczak's original HIStory statue, positioned throughout Europe to promote HIStory. Ben Beaumont-Thomas, music editor of The Guardian, stated that Jackson ushered in a global culture, writing: "We'll get to the music and dance, but perhaps his most astonishing achievement is his fame: he was the subject of global adulation, even in areas previously untouched by Western pop culture." 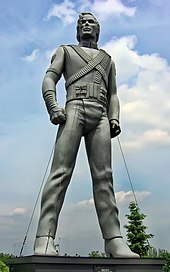 Tony Sclafani from MSNBC stated that "there was a time when Jackson was thought of primarily as a groundbreaking artist, not a celebrity oddball. That time was 1983, when Jackson’s omnipresence on the pop charts was revolutionary because no African-American artist had ever achieved that high a level of success. Jackson earned his pop icon status by creating music that transcended genres; he also redefined the roles of music videos and dancing in popular music". Many blacks now compare Michael with Barack Obama – perhaps the highest possible compliment in black America. Not only are they both integrationists and racial harmonists, but they both were determined to reach the top while refusing to let race hold them back. "There are so many components of why Barack Obama is president" says Diddy ,"and Michael Jackson is one of them. He started a change in the perception of the African-American male on a worldwide level: his strength, always putting himself in a powerposition, being seen as a hero." Al Sharpton echoes the point. "Way before Tiger Woods or Barack Obama, Michael made black people go pop-culture global" he says. "You had people in France, South America and Iowa comfortable with their kids imitating a black kid from Gary, Indiana. And when some of those people in Iowa grew, they were comfortable with voting for Barack Obama because they got comfortable imitating a black kid named Michael Jackson when they were young. Obama is a phenomenon, but he's the result of a process that Michael helped America graduate to. In 1996 Jackson visited Dona Marta Rio de Janeiro ,Brazil to film one of the video for They Don't Care About Us.When Jackson came to Brazil to shoot the video, directed by Spike Lee, Rio's local government became concerned that the singer would show the world an unflattering picture of poverty. Officials in the state of Rio feared images of poverty might affect tourism and accused Jackson of exploiting the poor.Others supported Jackson's wish to highlight the problems of the region, arguing that the government were embarrassed by their own failings. A judge banned all filming but this ruling was overturned by an injunction. Jackson also collaborated with 200 members of the cultural group Olodum, who "swayed to the heavy beat of Salvador"
Precarious houses in the favela of Complexo do Alemão in Rio de Janeiro. Identical scenes are viewable in the first music video of they don't care about us. When Michael Jackson decided to shoot his new music video in a favela of Rio de Janeiro ... he used the favela people as extras in a visual super-spectacle ... All the while there is a vaguely political appeal in there ... The interesting aspect of Michael Jackson's strategy is the efficiency with which it gives visibility to poverty and social problems in countries like Brazil without resorting to traditional political discourse. The problematic aspect is that it does not entail a real intervention in that poverty. In 2009, Billboard described the area as "now a model for social development" and claimed that Jackson's influence was partially responsible for this improvement. As a fashion pioneer, Jackson was the man who gave new meaning to moonwalking, immortalised solitary, sparkly gloves, initiated the trophy jacket trend in the Eighties and was brave enough to coupledress with Madonna on the red carpet..Just as his music and dancing have influenced today's young artists, from Justin Timberlake to Chris Brown, Jackson's style has also had an impact on many artists as well.The power of his determinedly idiosyncratic style was amplified by MTV, which beamed "Billie Jean" and "Beat It" around the world and made him its first Fashion Icon. Teenagers wanted what he had, taking break-dance lessons and wearing bow ties and single rhinestone gloves to school. ↑ Reuters Editorial. "Michael Jackson's music had impact around the globe | Reuters". in.reuters.com. ശേഖരിച്ചത്: July 11, 2017. ↑ "Michael Jackson's generous legacy - latimes". articles.latimes.com. ശേഖരിച്ചത്: July 11, 2017. ↑ "The Golden Age of MTV — And Yes, There Was One". npr. 2011-11-06. ശേഖരിച്ചത്: 2016-08-11. ↑ Rosen, Jill (June 28, 2009). "7 Ways Michael Jackson Changed The World". The Baltimore Sun. ശേഖരിച്ചത്: April 24, 2016. ↑ "80 moments that shaped the world". British Council. ശേഖരിച്ചത്: May 13, 2016. ↑ Chandler, Cory (May 20, 2010). "Librarians Prove Michael Jackson Was a Rock Star in Academic Literature". Texas Tech University. ശേഖരിച്ചത്: May 31, 2015. ↑ Hidalgo & Weiner 2010, pp. 14–28. ↑ Hidalgo & Weiner 2010, p. 25. ↑ "Michael Jackson: Five years after his death, how his influence lives on | Music | The Guardian". theguardian.com. ശേഖരിച്ചത്: July 11, 2017. ↑ By Tony Sclafani. "Jackson changed course of music, society - TODAY.com". today.com. ശേഖരിച്ചത്: July 11, 2017. ↑ Touré (June 26, 2014). "Michael Jackson: Black Superhero". Rolling Stone. ↑ "Brazil:Michael Jackson films video for 'They Don't Care About Us'". ITN. February 9, 1995. ശേഖരിച്ചത്: December 12, 2008. ↑ Dunn, Christoper (2001). Brutality Garden. UNC Press. p. 207. ISBN 0-8078-4976-6. ↑ Nagib, Lúcia (2003). The New Brazilian Cinema. I.B.Tauris. p. 123. ISBN 1-86064-928-9. ↑ "Michael Jackson Remains A Global Phenomenon". Billboard. July 2, 2009. ശേഖരിച്ചത്: June 10, 2010. ഈ താൾ അവസാനം തിരുത്തപ്പെട്ടത്: 01:18, 26 ഓഗസ്റ്റ് 2017.